CHANGE OF HEART! 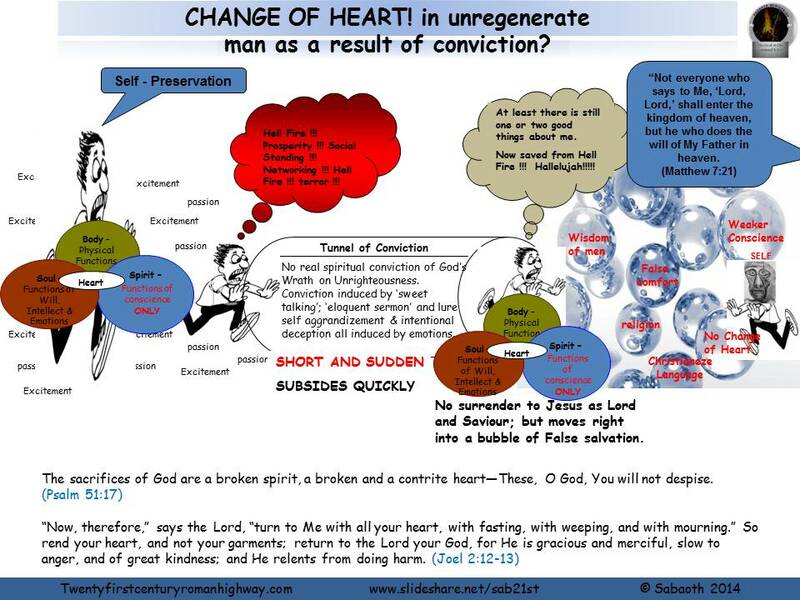 in unregenerate man as a result of conviction? 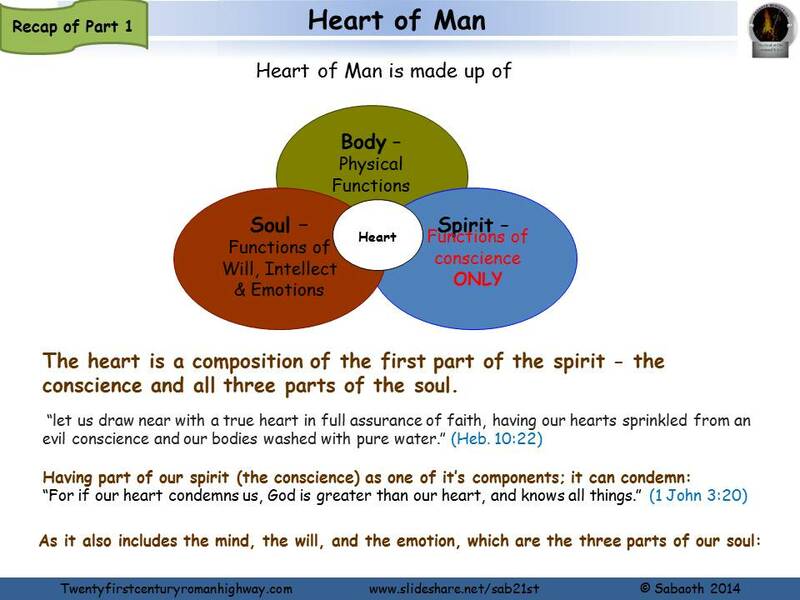 In this first segment of part 2, we have a look at the work of the Holy Spirit in bring life to a deadened conscience through quickening of the human spirit. The Law Law means instruction – dos and donts; the norms of society as enforced by the state. In the context of our topic here; “The Law” refers specifically to the compilation of decrees found in the first five books of the Bible. 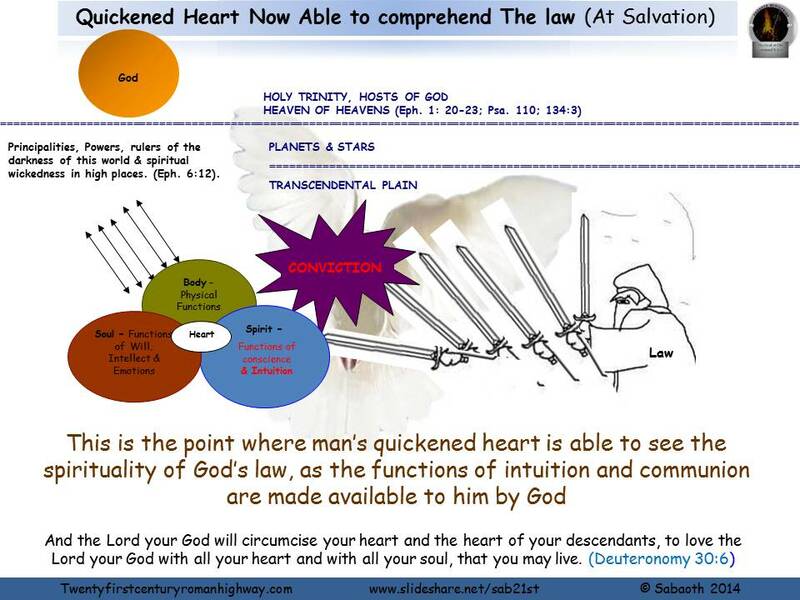 The Law is the great instrument which the Holy Spirit uses in His special work of conviction. It is the only yardstick through which we are to judge the moral evil or good in any action. These are holy and righteous demands that God places upon man. So if the law causes our desire to sin to increase, is it then safe to say that the law is bad? The answer here by Apostle Paul is No! !, Capital No!!! 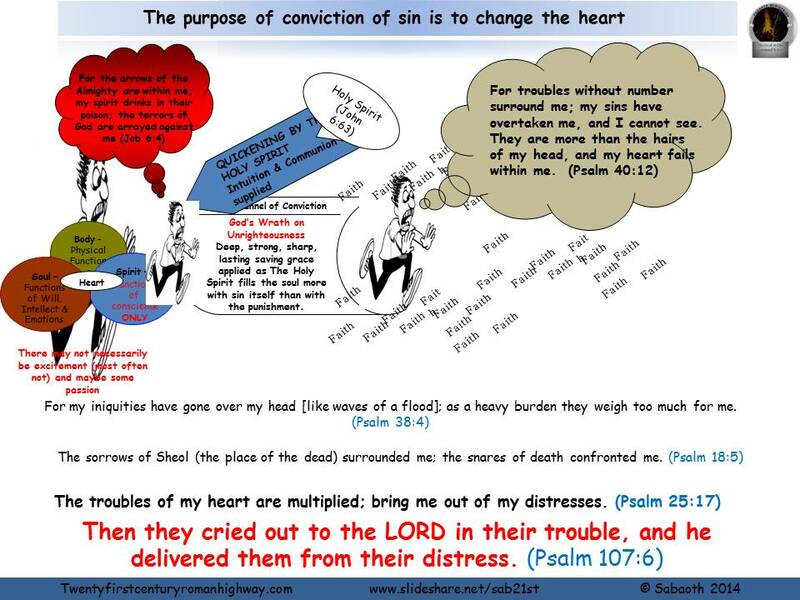 For if not for the law, we would not have known sin in its deadly nature; its resistance against God; in it‟s habitual enmity against God; and the hidden lustings it produces within us. God’s purpose of taking man through this act of conviction, is to change man’s heart to one that LOVES Him; his (man’s) spirit to one that is able to BE IN CONSTANT CONTACT with Him; RECEIVE Him; and HOLD or CONTAIN Him; so that man’s soul is able to REFLECT or EXPRESS Him in all that he thinks, likes, and decides- in all that he is and in all that he does. “For God so loved the world that He gave His only begotten Son, that whoever believes in Him should not perish but have everlasting life. For God did not send His Son into the world to condemn the world, but that the world through Him might be saved.” (John 3:16-17). How did He do it??????? 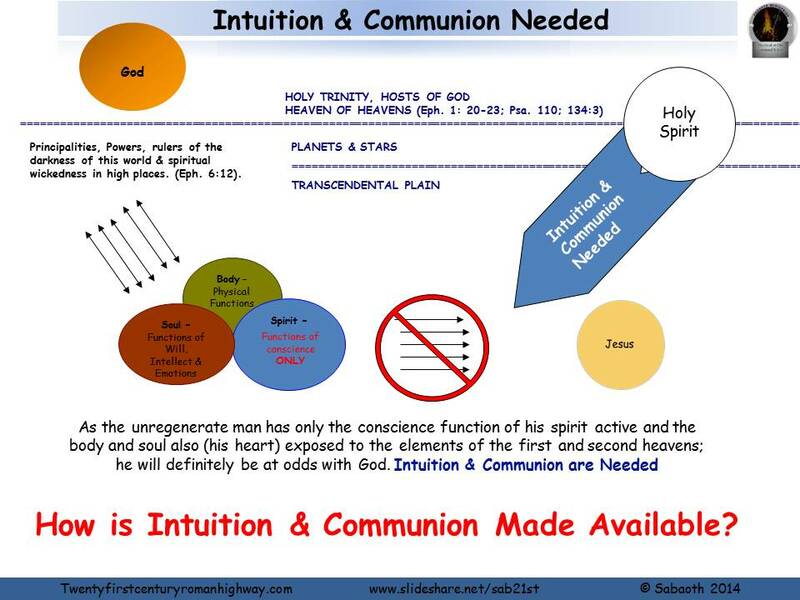 How is Intuition & Communion Made Available? 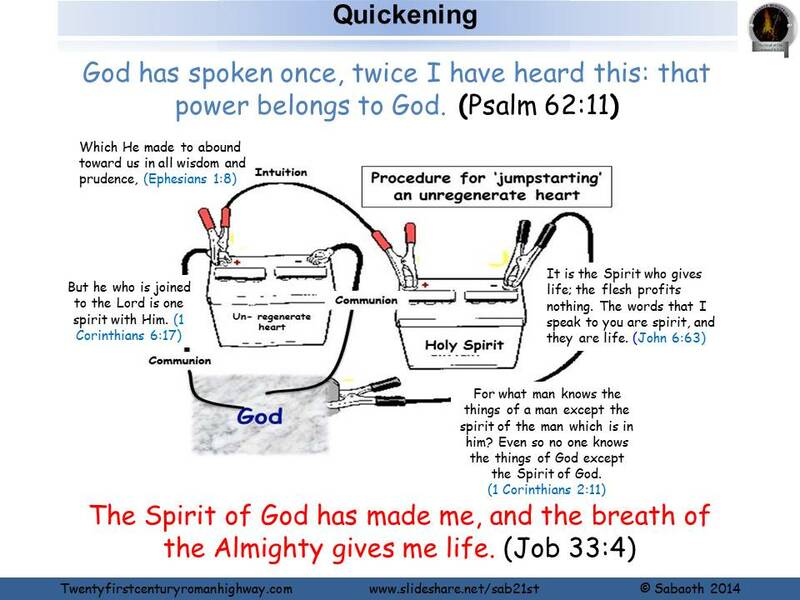 Quickening is the direct and supernatural operation of the Holy Spirit to effect a newness of life in the heart of man, so that he is able to receive the things of God (e.g. Word, directions etc.). Newness of life being the ‘activation’ of the intuition and communion in the spirit of man. 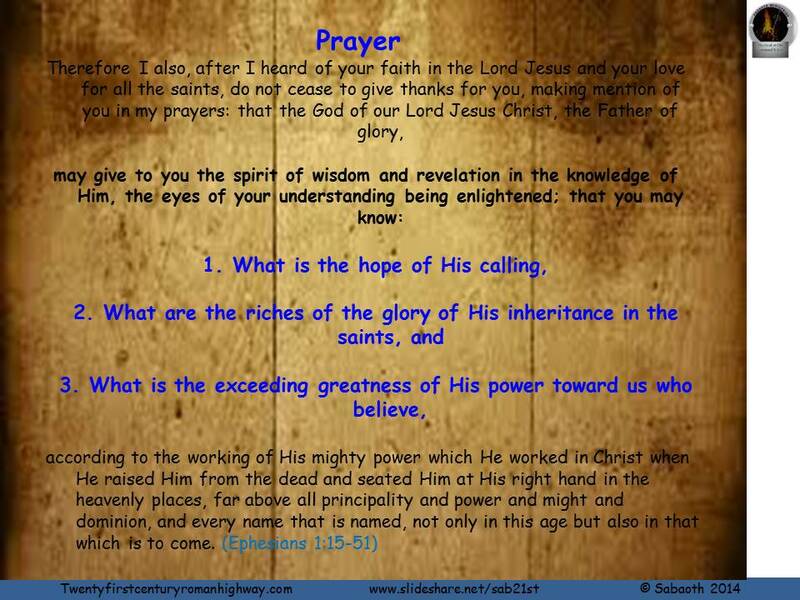 There is a need for the spirit to be able to operate inwardly towards God and commune with Him. There is also a need to make sure that the eye of the heart is ALWAYS BY FAITH, SURRENDERED TO THE HOLY SPIRIT so that we are by grace able to make optimum use of it. THIS BEING CHECKED against the state of our own conscience – A pure conscience leads to keen intuition; with a defiled conscience, the eye of the heart is handed back to the whims of a deceptive soul. A temporary connection is made between the discharged battery’s terminals and those of another running vehicle, or to some other external power source. When the connection is made, the external supply of current effectively bypasses the battery cells, passing directly into the vehicle’s electrical system through the terminal connections and providing the current needed to operate the starter motor. Once the vehicle has been started (and barring any other malfunction in the electrical system), the vehicle’s alternator will naturally recharge the battery over a running period ranging from 30 minutes to 3 hours. Just as insufficient power from a dead battery to the starter motor of a vehicle renders it unable to start itself; as no food can in any way provide energy for a dead man; although it is the function food to give energy; Spiritual truth cannot provide Spiritual liveliness to a mind that is dead to righteousness; as such mind is unable to capture the essence of the truth and similarly, Spiritual truth cannot make an unregenerate will to believe. “For the wrath of God is revealed from heaven against all ungodliness and unrighteousness of men, who suppress the truth in unrighteousness, because what may be known of God is manifest in them, for God has shown it to them. For since the creation of the world His invisible attributes are clearly seen, being understood by the things that are made, even His eternal power and Godhead, so that they are without excuse, because, although they knew God, they did not glorify Him as God, nor were thankful, but became futile in their thoughts, and their foolish hearts were darkened. 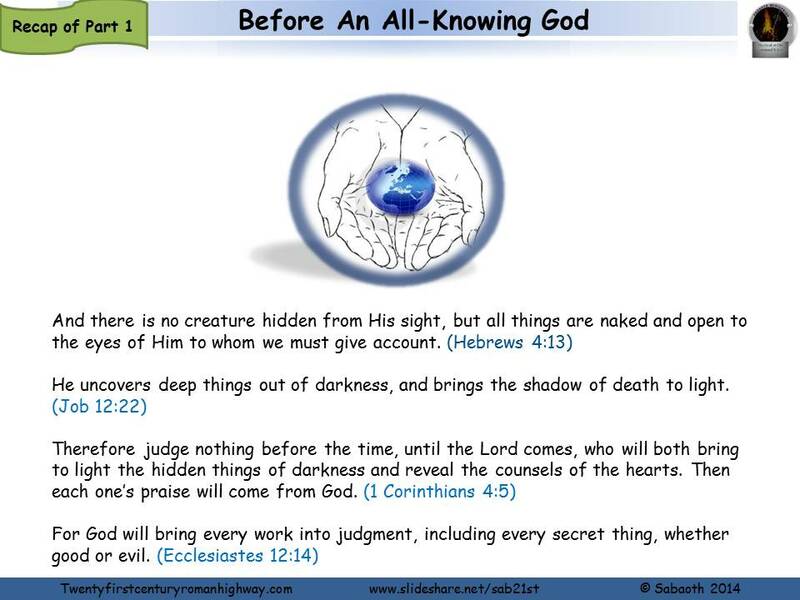 Professing to be wise, they became fools, and changed the glory of the incorruptible God into an image made like corruptible man—and birds and four-footed animals and creeping things. Therefore God also gave them up to uncleanness, in the lusts of their hearts, to dishonor their bodies among themselves, who exchanged the truth of God for the lie, and worshiped and served the creature rather than the Creator, who is blessed forever. Amen. 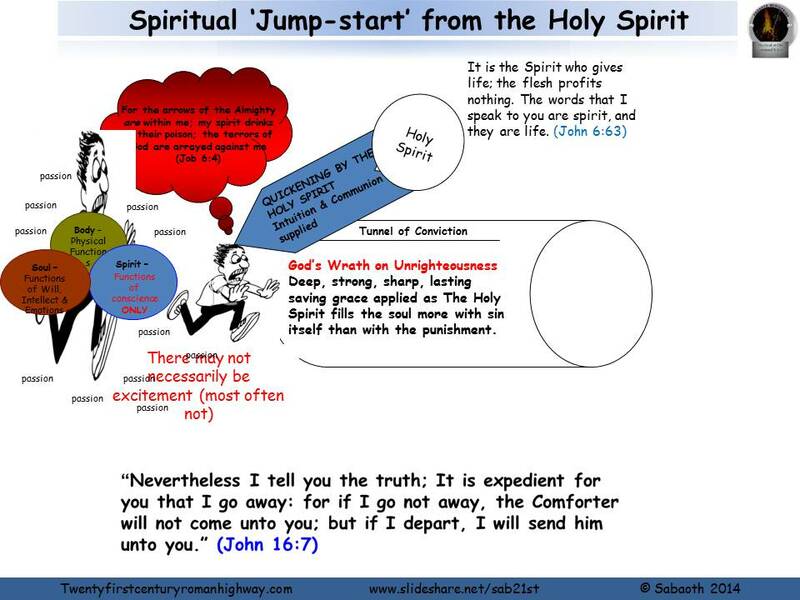 We have so far looked at the work of The holy Spirit as God Removes Man’s Sins and Their Consequences (on the regeneration side of salvation); but we will have a break to look at two other aspects of the salvation of man: Believe/Faith (Mark 16:16) Then Repentance (Isaiah 55:7) which are the building blocks of genuine conversion. 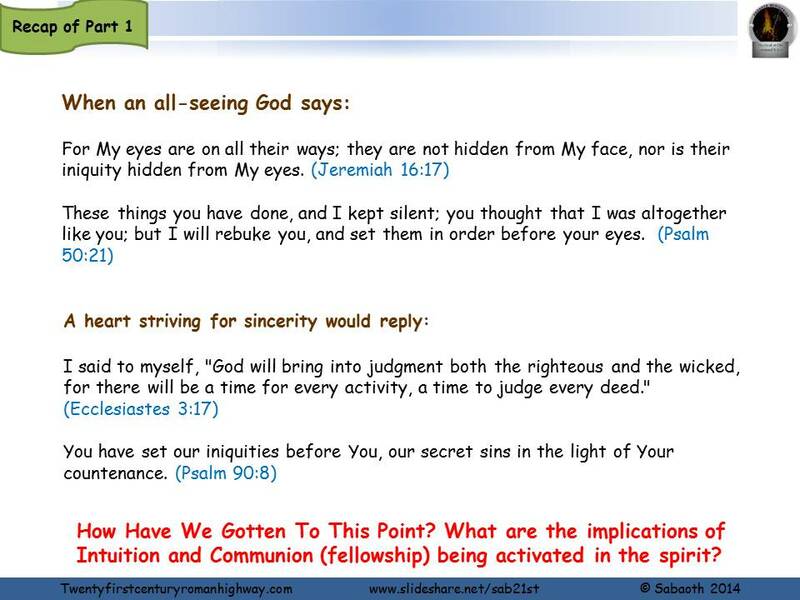 We will then go on to look at the purification of our soulish methods of trying to make contact with God which is activated (Already taken place at Calvary). . 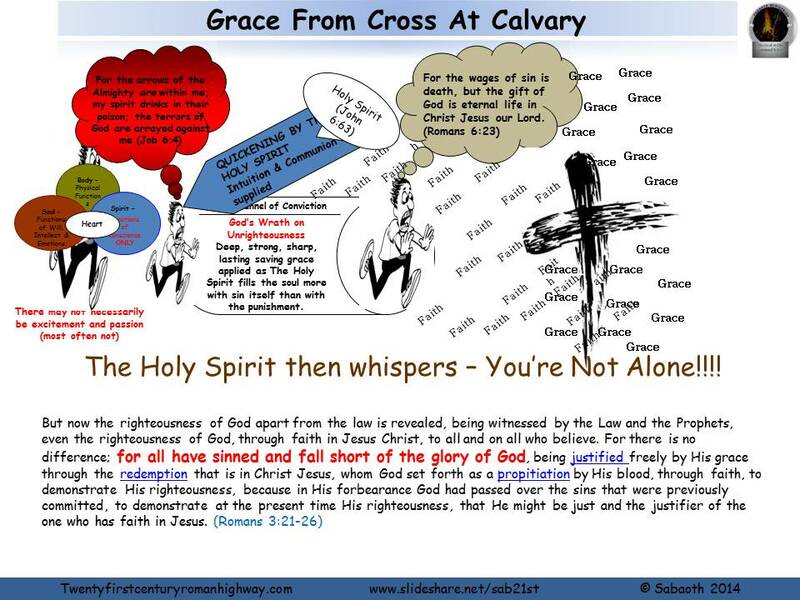 This we will look at in Part 2B of The Holy Spirit & Salvation God, According To His Will; By The Holy Spirit; Gives Him Grace For Righteousness.